NO PURCHASE NECESSARY TO ENTER OR WIN. MAKING A PURCHASE OR PAYMENT OF ANY KIND WILL NOT INCREASE YOUR CHANCES OF WINNING. VOID WHERE PROHIBITED OR RESTRICTED BY LAW.?? 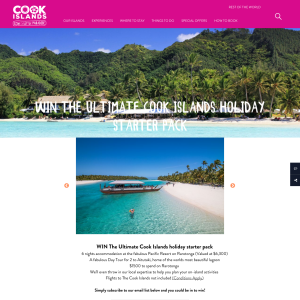 The sponsor of this ULTIMATE HOLIDAY STARTER PACK is Cook Islands Tourism Corporation (Sponsor). By participating in the ULTIMATE HOLIDAY STARTER PACK giveaway each Entrant unconditionally accepts and agrees to comply with and abide by these Official Rules and the decisions of Sponsor, which shall be final and binding in all respects. Sponsor is responsible for the collection, submission or processing of Entries and the overall administration of the ULTIMATE HOLIDAY STARTER PACK Giveaway. Entrants should look solely to Sponsor with any questions, comments or problems related to the ULTIMATE HOLIDAY STARTER PACK Giveaway. Sponsor may be reached by email at online@cookislands.gov.ck during the Promotion Period or via direct message on Facebook.??? Open to general public with an active and functional email address. Must be over the age of 18yrs. Cash pre-loaded on Mataora gift cards to the value of $1500. Can be used at participating outlets on Rarotonga and Aitutaki for duration of holiday only. Cannot be exchanged for cash or used to withdraw money. Airfares will be the responsibility of the prizewinner at an additional expense to them. We require the details of the prizewinner, including a photo within 7 days of the prize being drawn. Prizes cannot be transferred, redeemed for cash or substituted by winner. Sponsor reserves the right in its sole and absolute discretion to award a substitute prize of equal or greater value if a prize described in these Official Rules is unavailable or cannot be awarded, in whole or in part, for any reason. The ARV of the prize represents Sponsor's good faith determination. That determination is final and binding and cannot be appealed. If the actual value of the prize turns out to be less than the stated ARV, the difference will not be awarded in cash. Sponsor makes no representation or warranty concerning the appearance, safety or performance of any prize awarded. Restrictions, conditions, and limitations may apply. Sponsor will not replace any lost or stolen prize items.? This ULTIMATE HOLIDAY STARTER PACK Prize will only be awarded and/or delivered to addresses within said locations. All federal, state and/or local taxes, fees, and surcharges are the sole responsibility of the prize winner. Failure to comply with the Official Rules will result in forfeiture of the prize. Enter the The ULTIMATE HOLIDAY STARTER PACK during the Promotion Period online registeinf.? ?Automated or robotic Entries submitted by individuals or organizations will be disqualified. Internet entry must be made by the Entrant. Any attempt by Entrant to obtain more than the stated number of Entries by using multiple/different email addresses, identities, registrations, logins or any other methods, including, but not limited to, commercial contest/ULTIMATE HOLIDAY STARTER PACK subscription notification and/or entering services, will void Entrant's Entries and that Entrant may be disqualified. Final eligibility for the award of any prize is subject to eligibility verification as set forth below. All Entries must be posted by the end of the Promotion Period in order to participate. Sponsor's database clock will be the official timekeeper for this ULTIMATE HOLIDAY STARTER PACK.? ?? The Winner of the The ULTIMATE HOLIDAY STARTER PACK will be selected in a random drawing from among all eligible Entries received throughout the Promotion Period. The random drawing will be conducted after the Promotion Period by Sponsor or its designated representatives, whose decisions are final. Odds of winning will vary depending on the number of eligible Entries received.??? After the random drawing Winner will be notified by 24-48 hours by email and FB messenger. Potential Winner must accept prize as directed by Sponsor within 28days of notification. Sponsor is not responsible for any delay or failure to receive notification for any reason, including inactive email account(s), technical difficulties associated therewith, or Winner’s failure to adequately monitor any email account.Any winner notification not responded to or returned as undeliverable may result in prize forfeiture. The potential prize winner may be required to sign and return an affidavit of eligibility and release of liability, and a Publicity Release. No substitution or transfer of a prize is permitted except by Sponsor.??? Sponsor assumes no responsibility or liability for (a) any incorrect or inaccurate entry information, or for any faulty or failed electronic data transmissions; (b) any unauthorized access to, or theft, destruction or alteration of entries at any point in the operation of this ULTIMATE HOLIDAY STARTER PACK Giveaway; (c) any technical malfunction, failure, error, omission, interruption, deletion, defect, delay in operation or communications line failure, regardless of cause, with regard to any equipment, systems, networks, lines, satellites, servers, camera, computers or providers utilized in any aspect of the operation of the ULTIMATE HOLIDAY STARTER PACK Giveaway; (d) inaccessibility or unavailability of any network or wireless service, the Internet or website or any combination thereof; (e) suspended or discontinued Internet, wireless or landline phone service; or (f) any injury or damage to participant's or to any other person’s computer or mobile device which may be related to or resulting from any attempt to participate in the ULTIMATE HOLIDAY STARTER PACK or download of any materials in the ULTIMATE HOLIDAY STARTER PACK Giveaway.If, for any reason, the ULTIMATE HOLIDAY STARTER PACK is not capable of running as planned for reasons which may include without limitation, infection by computer virus, tampering, unauthorized intervention, fraud, technical failures, or any other causes which may corrupt or affect the administration, security, fairness, integrity or proper conduct of this ULTIMATE HOLIDAY STARTER PACK Giveaway, the Sponsor reserves the right at its sole discretion to cancel, terminate, modify or suspend the ULTIMATE HOLIDAY STARTER PACK in whole or in part. In such event, Sponsor shall immediately suspend all drawings and prize awards, and Sponsor reserves the right to award any remaining prizes (up to the total ARV as set forth in these Official Rules) in a manner deemed fair and equitable by Sponsor. Sponsor and Released Parties shall not have any further liability to any participant in connection with the ULTIMATE HOLIDAY STARTER PACK Giveaway.? ? ?